Since the late 19th century, restless adventurers have been drawn to the treacherous terrain of the Southern Alps, and to volcanic Mts Taranaki and Ruapehu. Today’s climbers may use ski planes and high-tech gear, but reaching a peak is as exhilarating as in the days of packhorses and canvas tents. New Zealand’s main mountaineering areas are in the South Island, especially the Southern Alps. The North Island has Mt Taranaki and Mt Ruapehu. Mountains were sacred to Māori. This restricted them from climbing the peaks. Europeans began exploring in the 1800s. In 1839 James Bidwill climbed Mt Ngāuruhoe, and in 1855 Maria Atkinson made the first major climb by a woman – to the top of Mt Taranaki. Aoraki/Mt Cook in the Southern Alps is New Zealand’s highest peak, at 3,724 metres. In 1894 a group of New Zealand climbers wanted to beat an Englishman to the top, and on Christmas Day they did. By 1955, there had been 100 ascents of Aoraki/Mt Cook. Many climbers have died on the mountain. In 1895 the government bought the Hermitage hotel, near Aoraki/Mt Cook, and employed mountaineers to be alpine guides there. They took serious climbers into the Southern Alps, cutting steps in the ice. With a guide, Australian Freda Du Faur was the first woman to climb Aoraki/Mt Cook. At this time, mountaineers used ice-axes, hemp ropes and goggles. They had canvas tents and sometimes used horses to carry their equipment and supplies. Food included beans, rice, bacon and dried fruit. Tourists still use guides today. During the 1930s many young people began mountaineering. They did not take guides to cut steps for them. Instead they used crampons – spikes on their boots that stopped them slipping on ice. After the Second World War, equipment such as ice screws, nylon ropes and lightweight stoves made climbing quicker and easier. By the 1950s all the difficult ridges of major peaks had been climbed. The next challenge was climbing faces – the slopes between ridges, which are harder to climb because they are so steep. One of the toughest was Aoraki/Mt Cook’s Caroline Face, first climbed in 1970. Today rock climbing and indoor climbing-walls are popular. In 1953 New Zealander Edmund Hillary and Sherpa Tenzing Norgay were the first to reach the top of Mt Everest in the Himalayas. 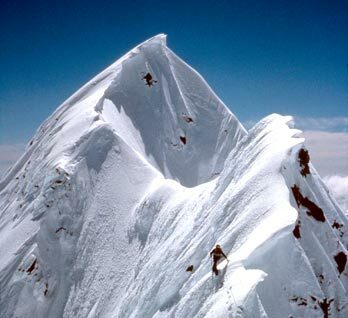 Murray Jones and Graeme Dingle climbed six difficult north faces in Europe in 1968. Rob Hall and Gary Ball climbed seven summits on seven continents in 1990. Mark Inglis, who lost his legs to frostbite in 1982, climbed Mt Everest in 2006.